Matthews is a candidate to earn snaps Sunday in Chicago with Quincy Enunwa (ankle) sidelined and Robby Anderson (ankle) doubtful to play, Matt Stypulkoski of NJ.com reports. Matthews agreed to a contract with the Jets on Tuesday, Adam Schefter of ESPN reports. Matthews will work out for the Jets on Tuesday, Adam Schefter of ESPN reports. The Browns are slated to work out Matthews on Monday, Mary Kay Cabot of The Cleveland Plain Dealer reports. Analysis: Since dealing Josh Gordon to the Patriots, the Browns have been on the lookout for veteran wideout help to add depth behind Jarvis Landry and to complement rookie Antonio Callaway. Matthews could therefore be a decent fit with the Browns, and if he does sign, there could be a path to targets for him once he absorbs the team's playbook. Matthews has drawn interest from multiple teams since being released by the Titans last week and is expected to sign with a club soon, Adam Schefter of ESPN reports. 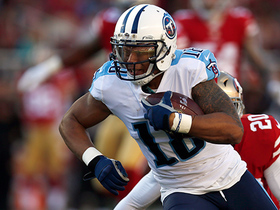 The Titans officially released Matthews on Thursday, Jim Wyatt of the team's official site reports. Matthews didn't report to the team for practice Wednesday and has asked the Titans to release him, Austin Stanley of A to Z Sports Nashville reports. Matthews hauled in one of his two targets for three yards Week 3 against Jacksonville. Analysis: Jacksonville presented a tough matchup for the Titans' passing attack, so this was unlikely to be the week that Matthews broke out. However, both Corey Davis and Taywan Taylor commanded more targets, leaving Matthews' role ambiguous for the coming weeks. 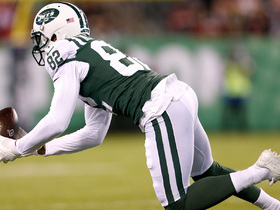 Through three weeks, he has only three catches on six targets for 11 yards. Matthews hauled in two of his four targets for a total of eight yards in the Week 2 victory over Houston. Analysis: Coach Mike Vrabel suggested that Matthews would see a bigger role in Week 2, and be tied for the second most-targeted player on the team. However, with Blaine Gabbert at quarterback, that didn't translate to much production as Matthews managed only eight total yards. His snap count also fell, though that may be linked to the conservative gameplan the Titans put in place for Week 2. Titans head coach Mike Vrabel suggested Wednesday that Matthews is likely to see his role gradually expand during the team's upcoming games, Jim Wyatt of the team's official site reports. "Rishard would be in that category of practicing better and playing better and knowing what to do, he would probably be out there a ton," Vrabel said. "And so he was out there, and I am sure we're all looking forward to getting him out there more." Analysis: Matthews had a 52 percent offensive snap share in Sunday's 27-20 loss to the Dolphins, finishing the game without a target while working behind both Corey Davis and Tajae Sharpe. It shouldn't be long before Matthews pushes Sharpe out of the starting lineup, but it can't be assumed it will happen Week 2 against the Texans. Sharpe played 84 percent of the snaps in Week 1, catching one of three targets for 17 yards. Matthews was not targeted in Week 1 against Miami. Matthews' snap counts could be monitored carefully early on during the season, the Jim Wyatt of the Titans' official site reports. Analysis: Matthews was sidelined for most of training camp and preseason before he resumed practicing just over a week ago. Though it looks like he'll have enough time to recover from a torn meniscus and suit up and start in Sunday's season opener against the Dolphins, Matthews' productivity could be limited while the Titans ease him back into their wideout rotation. Any snaps Matthews might surrender would likely fall to Taywan Taylor or Tajae Sharpe. Matthews (knee), who was removed from the PUP list Sunday, practiced Monday, Erik Bacharach of the Tennessean reports. Analysis: Matthews' previously-mysterious absence was finally chalked up to a torn meniscus, and his return to the field Monday puts him on track for the Titans' season opener against the Vikings. 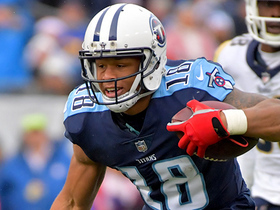 He's listed as a starting wideout on the team's depth chart along with rising young talent Corey Davis, though 2017 third-rounder Taywan Taylor should be a key factor in the team's receiving corps as well. Matthews (knee) has been cleared to practice after passing a physical, Jim Wyatt of the Titans' official site reports. Though Matthews is reportedly bouncing back from a torn meniscus, he could come off the PUP list as early as next week, according to PaulKuharsky.com. Titans head coach Mike Vrabel said he expects Matthews (undisclosed) to be ready for practice soon, Travis Haney of The Athletic Nashville reports. Matthews (undisclosed) signed a one-year extension that also gives him the opportunity to earn an extra $1.375 million this upcoming season, ESPN.com's Field Yates reports. Matthews (undisclosed) has agreed to a one-year extension for 2019, signing a team option with a base value of $7.75 million Field Yates of ESPN reports. Analysis: At first glance, this would seemingly explain Matthews' mysterious absence from practice, but it wouldn't make much sense for a player to end a holdout for a one-year deal that's merely a team option, and it wouldn't be within league rules for the Titans to place him on the PUP list without an injury. Whatever the case may be, this could be the first step toward the team finally providing some information on the situation. Matthews hasn't practiced since May. Matthews (undisclosed) still isn't practicing, Turron Davenport of ESPN.com reports. Analysis: The non-update Matthews update is becoming a weekly tradition. Neither the wideout nor his team has provided any information on the injury, but it's increasingly clear he won't play in any games this preseason. Matthews has been dealing with the undisclosed injury for at least three months, with the initial report coming during OTAs in May. Corey Davis is left without competition for the No. 1 WR throne in Tennessee, where Taywan Taylor is emerging as a favorite for the No. 2 job. Matthews (undisclosed) was on the sideline watching Wednesday's practice, Jim Wyatt of the Titans' official site reports. Analysis: It has been nearly three months since an issue was first reported and the Titans still haven't provided any details on the location or severity of Matthews' injury. With no signs of an impending return, the team seems to be moving forward with Corey Davis and Taywan Taylor as its starting wide receivers. Tajae Sharpe, Michael Campanaro (undisclosed) and Darius Jennings are the top candidates for the No. 3 role. Matthews (undisclosed) didn't play in Thursday's preseason game against the Packers, Jim Wyatt of the Titans' official site reports. Matthews (undisclosed) won't practice Monday, Jim Wyatt of the Titans' official site reports. Analysis: The Titans still haven't provided any details more than two months after reports of an injury first surfaced. Matthews did manage limited participation in parts of the offseason program, but he's currently on the PUP list, which prevents him from partaking in training camp. Tajae Sharpe, Taywan Taylor and Michael Campanaro have been filling in alongside Corey Davis with the first-team offense. Matthews (undisclosed) did not practice Saturday, Jim Wyatt of the Titans' official site reports. Analysis: The extent of Matthews' injury is still somewhat unknown, though there's also been no indication that the team is extra concerned. 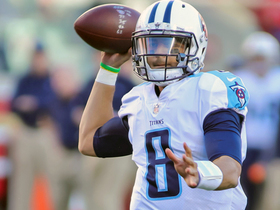 Barring any unforeseen circumstances Matthews should be a primary target for Marcus Mariota when the Titans open the season. Matthews is still recovering from an undisclosed injury, Jason Wolf of The Tennessean reports. Analysis: The injury was initially deemed minor but has now been lingering for at least two months. Matthews may still be available in a limited capacity for the start of training camp, as the Titans hadn't placed him on the PUP list as of Wednesday. Any absence would free up first-team reps for some combination of Taywan Taylor, Tajae Sharpe and Michael Campanaro. Matthews (undisclosed) is dealing with a minor injury and remains limited at OTAs, Jason Wolf of the Tennessean reports. Analysis: The Titans don't seem worried about Matthews' long-term outlook, as the receiver has reportedly been present with his team on the practice field without mention of any type of cast or brace on his body. While it isn't clear what sort of injury Matthews is dealing with, his limitations at this stage in the offseason aren't a big deal. His absence in team drills has allowed Corey Davis to operate as the clear No. 1 wideout. Matthews was present, but he did not participate in Tuesday's OTA session, Terry McCormick of TitanInsider.com reports. Coach Mike Vrabel indicated afterward that he will be worked back into the fold this offseason but wouldn't disclose if he is dealing with an injury. Titans general manager Jon Robinson said Wednesday that he doesn't anticipate adding any marquee wide receivers to the roster, as he's happy with the current group led by Matthews, Corey Davis, Taywan Taylor and Tajae Sharpe, Jim Wyatt of the Titans' official site reports. Matthews came away with just three catches for 27 yards on eight targets in Saturday's 35-14, divisional round loss to the Patriots. Analysis: Matthews faded badly down the stretch, totaling just seven catches for 97 yards in his final four appearances after averaging more than four receptions and 60 yards per contest in his first 12 games played. 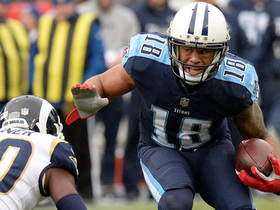 With tight end Delanie Walker still playing a major role in this passing game and rookie first rounder Corey Davis establishing himself as quarterback Marcus Mariota's go-to wide receiver late in the year, it wouldn't be surprising to see Matthews' recent decline carry over into next season. Matthews was held to a 15-yard catch on two targets in Saturday's 22-21 win over Kansas City in the wild-card round. Analysis: After catching at least three balls in each of his first 12 appearances this season, Matthews has totaled just four receptions over the past three games. 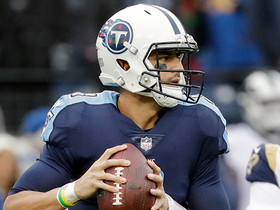 Quarterback Marcus Mariota threw two touchdown passes in this one, but they went to himself and Eric Decker. While Matthews has been quiet of late, his 13 touchdowns since the start of last season suggest he's still capable of being a difference-maker as the playoffs unfold. Matthews was held to just a seven-yard catch on two targets in Sunday's 15-10 win over Jacksonville. Matthews was held to two catches for 48 yards on four targets in Sunday's 27-23 loss to the Rams. Analysis: Matthews was overshadowed by fellow wide receivers Corey Davis and Eric Decker, who combined for 164 yards on 12 catches, though nobody in Tennessee's passing game was able to get into the end zone. He'll do his best to bounce back with a playoff berth potentially on the line against Jacksonville in next week's season finale, but the stingy Jaguars held Matthews to just three catches for 43 yards back in Week 2. 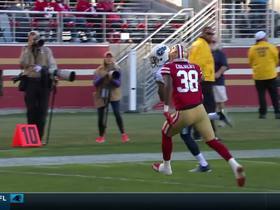 Matthews caught six of eight targets for 95 yards and a touchdown during Sunday's 25-23 loss to the 49ers. Matthews (hamstring) caught three of five targets for 19 yards in Sunday's 12-7 loss to Arizona. Analysis: Matthews was operating at less than 100 percent, and ended up tying Eric Decker for third on the team in targets behind Delanie Walker (nine) and Corey Davis (six). With quarterback Marcus Mariota (knee) also laboring, Tennessee's passing game will be difficult to trust next week in San Francisco. Matthews (hamstring) will play in Sunday's game in Arizona, Cameron Wolfe of ESPN.com reports. Analysis: Matthews was a limited practice participant Wednesday and a full participant Thursday, putting him on track to end his streak of absences at two games. He'll return to a likely matchup with Cardinals cornerback Patrick Peterson, who often shadows the top wideout on the opposing team. With Corey Davis yet to reach 50 yards in five games since returning from his own hammy injury, the Cardinals presumably will deploy Peterson against Matthews. 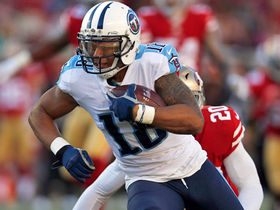 Matthews (hamstring) was a full participant in the Titans' practice Thursday, Jason Wolf of The Tennessean reports. Matthews (hamstring) confirmed after Wednesday's practice that he expects to play Sunday against the Cardinals, Cameron Wolfe of ESPN.com reports. Matthews (hamstring) was a limited participant at Wednesday's practice, Cameron Wolfe of ESPN.com reports. Analysis: Matthews returned to a limited practice Friday but ultimately was ruled out for Sunday's eventual 24-13 win over Houston. Titans head coach Mike Mularkey said Monday that Matthews was almost able to play in that game, leading to speculation that the wideout will be ready to play Week 14 in Arizona. A full practice before the end of the week would instill more confidence as Matthews prepares for a potential head-to-head matchup with Cardinals cornerback Patrick Peterson. Titans head coach Mike Mularkey said Matthews (hamstring) was almost able to play in Sunday's 24-13 win over Houston, but the team decided to play it safe with an eye on Week 14 against the Cardinals, Cameron Wolfe of ESPN.com reports. Matthews (hamstring) is inactive for Sunday's game against the Texans, Cameron Wolfe of ESPN.com reports. Analysis: For the second consecutive week, the Titans labeled Matthews a game-day decision heading into Sunday, but the wideout was once again unable to shown enough mobility during warmups for the team to clear to play. With Matthews out of commission, Corey Davis, Eric Decker and Taywan Taylor are expected to serve as the Titans' starting wideouts this week, with Davis representing the top candidate to lead the team in targets. Matthews (hamstring), who is officially listed as questionable for Sunday's matchup with the Texans, was limited at practice Friday and will be a game-time decision, Jim Wyatt of the Titans' official site reports. Analysis: Those considering Matthews in Week 13 lineups will learn of his status in advance of the first wave of games Sunday, as the Titans and Texans kick off at 1 p.m. EDT. If Matthews is out or limited Sunday, Corey Davis and Eric Decker would be in line to head the team's wideout corps, with Taywan Taylor and Harry Douglas also in the mix for added reps.
Matthews (hamstring) was working out on his own off to the side during Thursday's practice, Cameron Wolfe of ESPN.com reports. Analysis: For the second straight day to begin Week 13 preparations, it appears Matthews will go down as a non-participant in practice, clouding his status for Sunday's game against the Texans. Matthews was at least able to test out his hamstring with solo jogging and running, inviting some optimism that he might be able to practice Friday in some capacity. Matthews (hamstring) didn't practice Wednesday, Jim Wyatt of the Titans' official site reports. Matthews (hamstring) is considered day-to-day, Jim Wyatt of the Titans' official site reports. Analysis: Matthews was added to last week's injury report Thursday and ultimately held out of Sunday's 20-16 win over the Colts. His availability did at least come down to a game-time decision, suggesting he has a shot to avoid any further absences as the Titans prepare for Week 13 against the Texans. Eric Decker and Harry Douglas absorbed Matthews' usual snaps in Sunday's win, while Corey Davis and Taywan Taylor actually saw minor dips in snap share from the previous couple weeks. Matthews (hamstring) is inactive for Sunday's game against the Colts, Adam Schefter of ESPN reports. Analysis: Matthews' practice reps diminished as the week progressed, with the wideout failing to take part in Friday's session in any capacity and entering the weekend with a questionable designation. With Matthews now set to miss his first game of the season, Corey Davis and Eric Decker are expected to serve as the Titans' primary wideouts on the outside, with the newly activated Harry Douglas (knee) likely having a role as a slot man. Head coach Mike Mularky considers Matthews (hamstring) a "game-time decision" Sunday at Indianapolis. Analysis: Matthews' practice reps diminished as the week progressed, culminating in a DNP at Friday's session. Because the hamstring designation appeared suddenly Thursday, his status will be the sole one concerning the Titans as they prepare for Sunday's divisional matchup. An absence would thrust wide receivers Corey Davis, Eric Decker and Taywan Taylor into more prominent roles. Matthews (hamstring) is listed as questionable for Sunday's game against the Colts after not practicing Friday, Jim Wyatt of the Titans' official site reports. Analysis: Rather than see his outlook brighten Friday after being added to the Titans' injury report Thursday following a limited practice session, Matthews' status for Sunday's 1:00 ET kickoff is now very uncertain. 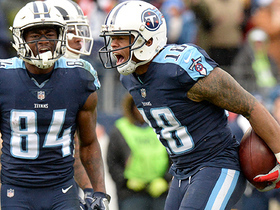 If he is out for the contest, or limited, Corey Davis, Taywan Taylor and Eric Decker would head the Titans' wideout corps this weekend. It's worth noting that Matthews is the only player listed on the team's Week 12 injury report. Matthews (hamstring) was limited at Thursday's practice, Jim Wyatt of the Titans' official site reports. Analysis: Matthews' status is thus worth tracking as Sunday's 1:00 ET kickoff against the Colts approaches. What he's able to do at Friday's practice will be telling with regard to the wideout's Week 12 status. 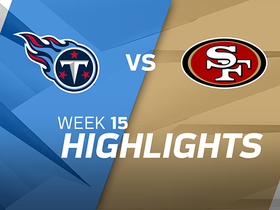 Matthews hauled in five of six targets for 113 yards and a TD in the Titans' Week 11 loss to the Steelers. Matthews hauled in five of six targets for 113 yards and a touchdown in Thursday's 40-17 loss to the Steelers. Matthews caught five of seven targets for 50 yards in Sunday's 24-20 win over the Bengals. Analysis: Matthews ranked third in targets behind Corey Davis (10) and Delanie Walker (nine). 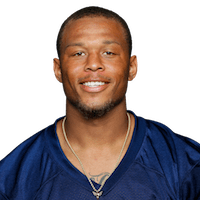 The veteran wide receiver has been consistently mediocre this season, finishing between three and six catches and between 34 and 87 yards in every game this season. Matthews caught four of seven targets for 70 yards and a touchdown in Sunday's 23-20 win over Baltimore. Analysis: Matthews was wide open in the end zone from 16 yards out late in the first quarter. The touchdown was only his second of the season, as Matthews has disappointed in that regard after scoring nine times in his last 12 games last year. Rookie wide receiver Corey Davis (hamstring) returned for the first time since Week 2, but Matthews' workload should remain steady regardless of who suits up on the outside opposite him.